When you’re planning to downsize, there’s no one-size-fits-all (sorry) plan. Some people want to do it while they’re still active enough to settle in a new locale and enjoy it, while others want to stay put for as long as possible so that they’re nearer family and friends. You need to weigh up these factors before you make any plans. Here’s the other things you need to think about. 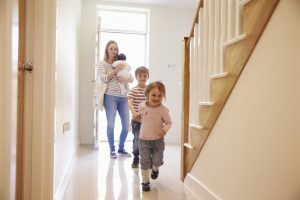 Can your children and grandchildren stay comfortably in the new place? If you’re moving from a fairly large house to a one-or two-bedroomed place, then this might make it more difficult for everyone to stay with you. If regular visits are important to you as a family, then don’t downsize too far and opt for somewhere with at least one spare room. Can they get to you comfortably in the first place? You’ve always dreamed of moving to Orkney, but how often will people want to drive, fly and boat to you? You may be restricted to annual week-long visits rather than regular day-long catch-ups and this can feel very lonely. The great thing about market towns is that everything you need – shops, doctor, social clubs and so on – is within easy reach so you don’t face a long walk or drive for anything essential. Market towns tend to be smaller, too, so it’s easier to meet people. Most downsizers want a big kitchen with lots of eating space as well as at least one reception room for family events. There are lots of new-builds that have older people and their needs in mind, or alternatively, a flat in a renovated and divided Georgian pile or country house is ideal. If a garden is important, a smaller, flat one is best in the long term. No matter what stage your downsizing plans are at, it’s never too early to start de-cluttering. If you’re moving after at least a decade, you’ll have accumulated more stuff than you realise, so you’ll need more time! Draft the family in to help – it can be a trip down memory lane for you all.